In this video we use the Dev Desktop application to rapidly set up a web environment and install a Drupal site on a Mac. We also review where to find your Drupal file directory and database when you need to back your project up or install new modules and themes. In these next videos we're going to setup a web environment using Dev Desktop on a Mac. If you're on a Mac these videos are for you, if you're on Windows or Linux you can safely skip these. 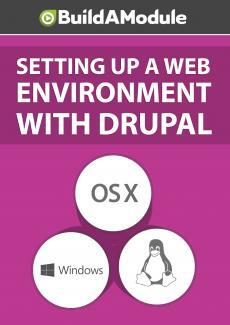 The quickest way I found to setup a Drupal web environment is through an application called Dev Desktop. So what we're going to do here is install Dev Desktop, setup a site and then also show how to empty out that site folder so you can use it to follow along with any of the cross-platform videos on Build a Module. So here in Google I'm going to search for Dev Desktop, and I'm going to go to the first link. I'm going to click download now and here I am on Acquia dot com slash downloads and I'm going to click the Mac download. I'll click save. When it's done downloading I'm going to launch it and then I'm going to double click the Acquia Dev Desktop installer dot app. It may ask you for a password. Click next. Next again. We'll accept the license agreement and you can choose whether to keep the diagnostic information checked here. I'll click next. I'm going to leave these at the defaults but you can change the location where the application is actually installed in the default sites folder. Although keep in mind that it's possible to locate your sites elsewhere on your hard drive by importing them to Dev Desktop. I'll click next. Most of the time you can leave these ports at their defaults, but if you have another stack installer it may conflict. You can always come back and change these later. I'll click next. And next again, and then finally next to begin the installation process. We'll keep this checked and click finish, and here's a dialogue that helps you get started.